Join Us for the 2018 Pre-Conference Meeting! We invite you to join us for a dynamic meeting designed to increase understanding of strategies and opportunities aimed at creating and implementing policies to promote health and equity throughout the African Diaspora. The event is scheduled from 8 AM - 5 PM at the Hilton San Diego Bayfront Hotel in San Diego, CA. Learn more about our pre-conference collaborators! 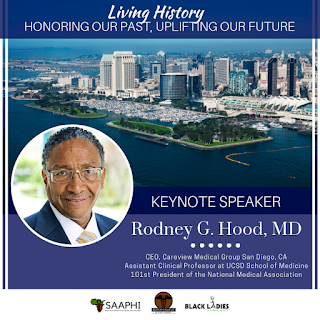 The Society for the Analysis of African American Public Health Issues (SAAPHI) is a non-profit (501c3) national public health organization comprised of researchers, physician and health advocates dedicated to improving the overall health of African Americans. The organization promotes and utilizes research to inform scientific knowledge, program development, and policy decisions. The Black Caucus of Health Workers (BCHW) is an independent organization, officially affiliated with the American Public Health Association (APHA). This year BCHW celebrates their 50th Anniversary! BCHW serves as a catalyst for influencing the recognition of the health care needs of Black people in America by APHA and other health related organizations. The organization strives for the elimination of disparities and the reduction of gaps in health and health outcomes by improving the quality of life of people of African descent through advocacy, knowledge, practice and research. Black Ladies in Public Health (BLiPH) is an online community with a real-world impact! BLiPH is an international group that promotes scholarship, service, self-care, support and a safe space for Black Ladies interested in, training and working in Public Health. BLiPH.org serves as a safe-space and resource for Black Ladies in Public Health and our allies! Board 8 Black women’s perceptions of seeking heart disease and health information on social media - Casey Adams Jones, M.A. 9:30 a.m. ACE’s mask trauma’s full story: A life course examination of violent victimization and homicide bereavement among young black men in Baltimore - Jocelyn Smith Lee, Ph.D.
2:00 p.m. Leveraging Public Health and Housing Agency Resources to Fight Food Insecurity in Cook County: Paving New Ways to Fight Food Inequality and Hunger in Low-Income Suburban Communities - Terry Mason, M.D. Table 1 Food insecurity and coping strategies among HIV-Positive black women in Rural Alabama - Andrew Zekeri, B.Sc., M.Sc., Ph.D.
3:32 p.m. Workforce Diversity as a Social Determinant of Health: Expanding Conceptual Linkages to Health, Health Disparities, and Health Equity - Jeffrey Hall, Ph.D, M.S.P.H., C.P.H. 4:04 p.m. Civil rights as determinants of public health and racial and ethnic health equity - Robert Hahn, Ph.D., M.P.H. 10:50 a.m. Beyond Food Deserts: The Impact of Appetite Deserts in Low-Income Suburban Communities - Terry Mason, M.D. 11:10 a.m. A Qualitative Inquiry Exploring Health, Lifestyle Choices and Neighborhood Decline in South Suburban Chicago, Illinois - Terry Mason, M.D. 11:30 a.m. Impact of Social Determinants of Health on Racial Inequities in Preventive Health Practice between Young Black Men and Young White Men on College Campuses in North East Illinois - Terry Mason, M.D. 12:50 p.m. Black Women Stressors and Coping Strategies: A Qualitative Exploration - Kamesha Spates, Ph.D., M.S. 12:30 p.m. #BlackMentalHealth on Instagram - Randl Dent, M.S. 1:30 p.m. What’s in a Label? : Examining the efficacy of racial and ethnic social identity labels in health messaging - Felicia Harris, Ph.D.